The ancient astrology developed in the northern hemisphere in populations living at mid-latitudes corresponding to the temperate zone. 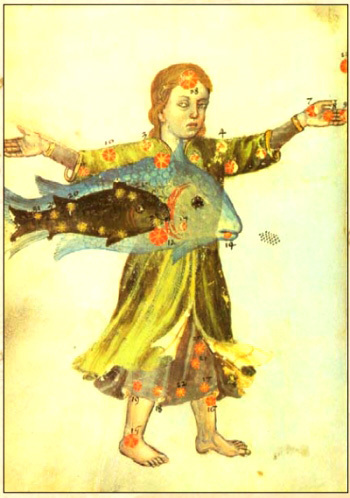 In this climate zone, where there is a clear distinction of the four seasons in the year  , the “scholar of the sky”, through repeated observations, could grasp the connection among certain celestial figures and the change of physical conditions, variations and alterations of biological phenomena: he could make reference to climatic changes, the growing and decay of biological organisms, the periodic change of the condition of life and the events of human beings. Within this conception of the world it was created a “language of the stars” that man can grasp. It is an archaic science in which a reflection of the “building blocks” takes shape. These “building blocks” can give account of the genesis and course of life, they are denominated “Basic elements” and “humors” and they also underpin the basic astrological principles. The interpretation of the unique and original mixture of elements and humors, from moment to moment and place to place, provides a survey tool on important aspects of the physical and biological life and the life of man (that’s why the first consideration must relate to the “quality” of the place and the moment of birth, as it is understood in astrology). Intuitively, the “expert of stars” had understood that the original moment of the physical birth (conception and birth) contains key information of an inheritance and a biological path consisting of origin, growth, development and end. Today the modern scientist begins, through the study of DNA, to decipher the genetic inheritance (the memory of the evolution of man’s “experiences” over thousands of years) and the fundamental organic factors. 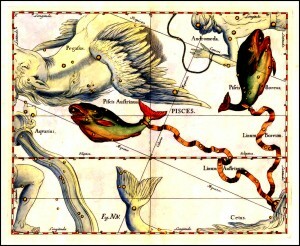 Within this idea of genesis and of the world, these two factors (place and time of birth) give ever-changing qualities and characteristics with which we can interpret (or we try to) what is shown by the celestial figures (the connections of luminaries, planets and stars in comparison with the centre of the Earth). In simpler terms, “the atmosphere in which a man was born” (if we were born in spring or winter, in a very dry or very wet place, and then the special “mixture” of hot or cold, wet or dry) creates ever-changing circumstances which “represent” (but they do not generate) the different ways in which the biological changes and the events of human life occur. According to this view, we attribute to spring, summer, autumn and winter, all the characteristics and qualities that are valid and must be considered in the same way for the births of the southern hemisphere, where the progress of the seasons is contrary to what happens in the northern hemisphere. When in Italy or the United States or Japan it is spring, in South America or South Africa or Australia it is autumn; when it is winter in the northern hemisphere, it is summer in the southern hemisphere, and so on  . To calculate the figure of birth in the northern hemisphere for first we convert the civil time (solar time or time zone) in Universal Time (U.T.). In places situated east of the Prime Meridian (Greenwich) we subtract the time zone to the civil time.In places situated west of Greenwich we add the time zone to the civil time. In ephemeris we seek the sidereal time of Greenwich of 0.00 am of the day of birth to which is added the longitude (converted into time) of the place of birth, if the place is east, or it is subtracted from that value if the place is west to Greenwich. The past time after 0.00 am is then divided by the coefficient of acceleration of the sidereal time (whose value is 0.9972696) to determine the local sidereal time. From the local sidereal time we get the Right Ascension of the Midheaven and its zodiacal longitude. By adding 90° to Right Ascension of the Midheaven we get the Oblique of the ascendant (or birth horoscope) and its zodiacal longitude. Then we trace the four angles and the diagram of the twelve signs of the zodiac. Using one of the domification system handed down by tradition, we consult the tables of poles (or we go on with their trigonometric formulas) for the calculation (as for me, with the Placidus system  ) of the mixed ascensions that allow us to define the subsequent cusps following the angles ASC/DISC, MC/IC. At this point, the astronomical ephemeris provide longitudes, latitudes and declinations of the Sun, Moon and planets for 0.00 a.m. of every day of the year . By interpolation of the values before and after the moment of birth, we obtain longitude, latitude and declination of the planets of the moment of birth. Finally, the other elements of nativity are calculated. In the case of birth in the southern hemisphere we convert the civil time (local or time zone) in Universal Time (U.T.). In places situated east of the meridian of Greenwich the time zone is subtracted to the civil time, for the places situated west the time zone is added.In ephemeris we seek the sidereal time of Greenwich of 0.00 am of the day of birth to which is added the longitude of the place of birth, if the place is east, or it is subtracted from that value if the place is west to Greenwich. The past time after 0.00 am is then divided by the coefficient of acceleration of the sidereal time to determine the local sidereal time. Up to the determination of the local sidereal time or hour angle of the First point of Aries (which is the first sign of spring in the northern hemisphere  ) we proceed in the same manner used for births in the northern hemisphere. As regards births in the southern hemisphere our gaze toward the Midheaven makes exactly one revolution of 180 degrees, then we have to add 12 hours to the found time to obtain the real local sidereal time of the city set in the southern hemisphere, that is the hour angle of 0 ° Aries (of the first spring sign of the southern hemisphere ). Consequently, all the “names” of the“Signs” that we will use must refer to the seasonal cycle that is generated in the southern hemisphere, so Aries is the sign in which the Sun enters the 23 of September (Libra in the northern hemisphere), Cancer is the sign in which the Sun enters the 21 of December (Capricorn in the northern hemisphere), and so on . Ultimately, while drawing the birth chart of the southern hemisphere we will add 12 hours (hours corresponding to 180°) to the local sidereal time (which is calculated for births in the northern hemisphere) to put ourselves in the right perspective and in the right observation of the southern sky. The names of the immaterial signs, of the twelve houses of the tropical zodiac, actually, pertain to the constellations (celestial images) and do not pertain to signs. Over time, the overlap of meanings between images and signs has been a source of misunderstanding. The astrological signs have no name and to define them properly it is necessary to refer to the specific quality, dignity and debility related to each of them . For example, Aries is springlike, equinoctial, curved or oblique, with a north or northern or boreal or right declination, … equipotent and it watches Virgo and rules Pisces, together with Leo and Sagittarius, it is male, diurnal, igneous … regal, hegemonic, hot, dry, irascible, brave, fleshy … liberal, directive, house of Mars, exaltation of the Sun, Triplicityof Sun and Jupiter … and so on. For this reason, when in the southern hemisphere it is spring we will have to refer to spring “signs” (adding 180° – that is to add 12 hours – to astronomical data contained in the ephemeris), called Aries, Taurus and Gemini, for births that take place from the 22/23/24 of September to the 21/22/23 of December  . The visual perspective and the movement of the sky change (because our viewpoint is reversed) . Then the same procedure is used for the calculation of the Right Ascension of the Midheaven and cusps of the houses. As regards the determination of the ecliptic coordinates of the planets we have to add 180° to the longitude and reverse the sign of declination and latitude (because what is over the equator to the sky watcher placed in the northern hemisphere, it is under the Equator to the observer situated in the southern hemisphere). With regard to the position (and visual proximity) of the planets compared with the fixed stars, nothing changes between North and South hemisphere except the consideration of the position (if it stays below or above), of the planet compared to the star and the position of both compared to the equator . The astronomical seasons are periods within the year characterized by changes in the declination of the Sun and the different height of the sun above the horizon at noon. This is due to the fact that the Earth, while moving along its orbit, is differently inclined with respect to solar rays. In hot seasons the sun is higher on the horizon, there is an increase of light and a positive value of North declination; in cold seasons the sun is lower on the horizon, there is a decrease of light and a negative South declination. The variations of declination, diurnal arcs and height of the sun meridian at different latitudes, modify significantly the length of day (except at the equator) and the intensity of light rays with direct consequences on temperature changes, change of the wind nature and the main meteorological factors which characterize the climatic seasons. 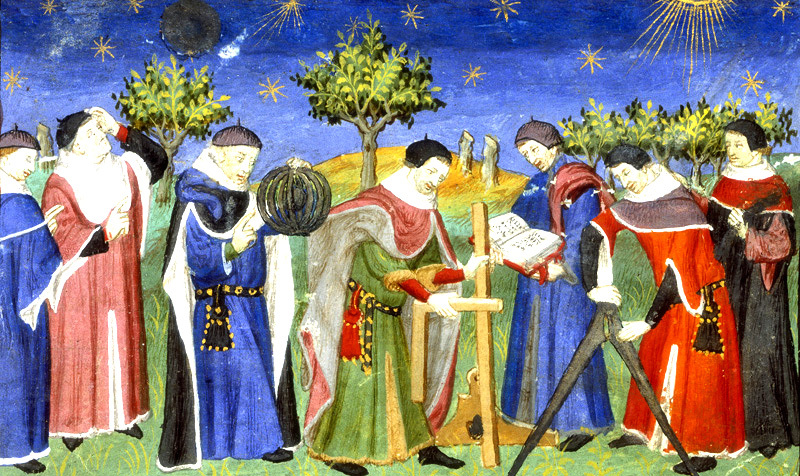 As regards the question which in his day concerned not only theoretical considerations, Gerolamo Cardano, the great mathematician, physician and philosopher, born in Pavia and lived between 1501 and 1576, on the doctrine of Ptolemy, had supported the need to reverse the planetary dignity (that is the astrological signs) while writing about the theme of births in the southern hemisphere. The method of domification of Placidus de Titis, which is the same of Ibn Ezra and Jerome Diedo, is based on the division of the diurnal motion. Each diurnal or nocturnal semi-arc is divided into three equal parts, each one equals 2 hours, and the time circles passing through the points of division represent the boundary between one house and another. The points where the time circles cross the ecliptic are the cusps of the Houses. From the pole of the world the circles of declination branch off, from the ecliptic pole, the circles of latitude branch off. Now, the astronomical coordinates of the ephemeris (sidereal time, longitude and ecliptic latitude, declination) are calculated, by custom, with regard to the northern hemisphere. To comply with an astronomical reality, the ephemeris for the southern hemisphere should be written out, and they should be perfectly symmetrical to the others. 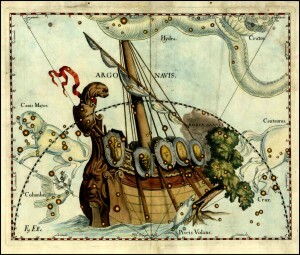 “Because of the precession of the equinoxes, every 25,800 years – calculated on the basis of the current displacement – the gamma point coincides with the beginning of the constellation of Aries; and as it is all contained within the first immaterial sign, so the starry zodiac, as a whole, appears to coincide with the tropical zodiac. In reality it can never occur a precise overlap of the 12 celestial figures, which are separated from each other by interstellar space (in some cases, by enormous space, like between Aries and Taurus) and each figure of different sizes corresponding to the 12 divisions of the ecliptic, each one of 30°. The most recent period who saw this coincidence (III sec. A.C.) is the same one in which the body of theory of astrology was forming.” (Note 18 of the report by Joe Fallisi “Maradona and the southern hemisphere,” Acts of the Second International Congress of Astrology ICOA, Venice 1997). “With regard to the signs of the zodiac, we begin with the twelfth portion of the ecliptic that lies north of the intersection point of the equator and the ecliptic, in accordance with the second motion, that is the precession of the equinoxes. In this way, the summer solstice will always fall at the beginning of the fourth sign, the winter solstice at the beginning of the tenth”. (Al-Bîrûnî, The stars, the time, the world. Journey in the secret India, Xenia, Milan 1997, p.210). The signs of the zodiac were established in the temperate zone, where the seasons assume a distinct physiognomy clearly perceptible from a climatic point of view. The moment of vernal equinox (that is one of the two points of intersection of the ecliptic with the celestial equator), for the northern hemisphere indicates a portion of the immaterial zodiac (Dodecatemoria), which took the name of Aries, whose degrees have North declination in comparison with the high Pole of reference. “From the astronomical point of view, the two fundamental characteristics of the signs are: the first one in relation to the equinoxes (North or South declination), the second one in relation to the solstices (ascent speed). 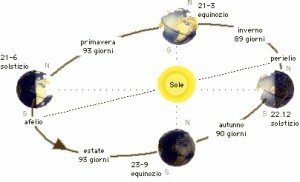 During the spring equinox the North declination of the Sun begins (positive, above the celestial equator) and it keeps on growing up to the summer solstice (Aries, Taurus, Gemini, where the sun increases the day length, and it has a growing North declination); then, it gradually decreases until the autumnal equinox (Cancer, Leo, Virgo). From this point the Sun begins to have a South declination (negative because it is below the celestial equator) and it continues to set until the winter solstice (Libra, Scorpio, Sagittarius); from this point it goes up again, until it reaches again the spring equinox (Capricorn, Aquarius, Pisces). And while from winter to summer solstice the signs rise with a faster motion, in less than two equinoctial hours (Capricorn, Aquarius, Pisces, Aries, Taurus, Gemini: curved or oblique signs, with a short ascension), from the summer to winter solstice they arise with a slower motion, in more than two equinoctial hours (Cancer, Leo, Virgo, Libra, Scorpio, Sagittarius: right signs, with a long or right ascension).” (Passage from the report by Joe Fallisi “Maradona and the southern hemisphere,” Acts of the Second International Congress of Astrology ICOA, Venice 1997). “(…) At the beginning of the observation of the sky, there is the determination of the celestial positions compared with the horizon, later compared with the stars taken as point of reference or on the basis of the Sun way, as in Babylon, or at the equator as in China; then longitudes are set with reference to the transit of bright stars at the meridian. Finally, with the determination of a zodiac unrelated to constellations, mathematically divided and fixed to the equinoxes and solstices, longitudes are determined starting from the vernal equinox. In particular, these last two methods coexisted in Greek-Roman period. Neugebauer saysthat “precise mathematical reasons were those that led to introduce a well-defined large circle which measured the progression of the sun and planets as to long sections measuring exactly 30 degrees.Indeed, the zodiac was nothing more than an indispensable mathematical idealization and it was used exclusively for the astronomical calculation”.(G. Bezza, Arcana Mundi, I vol., op. quot., pp. 111-112). 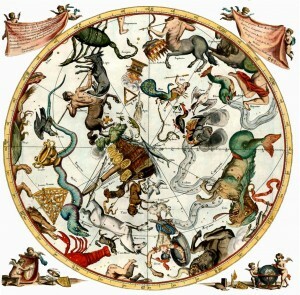 “For each sign of the zodiac – Abdar-Rahmanas-Sufi points out – ‘has been given the name of the figure found at the time of the observations’, but usually in Arabic and Persian astrology, contrary to the habit of the Byzantine compilers, there are not special symbols for the signs of the immovable zodiac, but they are simply numbered from 0 to 11” (G.Bezza, Arcana Mundi, I vol., op. quot., pp. 114-115) “in alphabetical order said abjad, which is the use of letters of the alphabet according to their numerical value (huruf al-jummal)” (G. Bezza in al-Biruni, The art of astrology, Mimesis, Milano 1997, p.139). 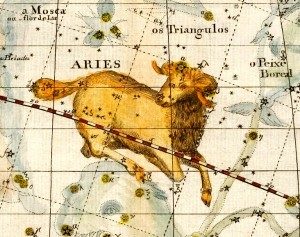 “Both the nature of the signs, and that of the image is constant: the sign of Aries is always masculine, diurnal, movable, the image of Aries is always that of a quadruped, whose stars in the horns have a similar temperament to that of Saturn and Mars, those in the tail to that of Venus, etc. We can say that both of these natures are constant, because they do not change by the passing of time (…): the wise astrologer shall join image to sign and from this union by right mixture a third nature originates (…). ” (G. Bezza, Commentary on the first book of Tetrabiblos by Claudius Ptolemy, op. Quot., P.240). See. V. Nabod, Astronomicarum institutions libri tres,Venetiis 1580, Cap. 11. In the two equinoxes, at the equator, the sun is at its zenith and the polar axis is perpendicular to the rays of the sun; in that moment the day length (12 hours) equals the duration of the night. In the northern hemisphere on 20-21-22 of March spring begins, while in the southern hemisphere autumn begins; on 22-23-24 of September in the northern hemisphere autumn begins, while in the southern hemisphere spring begins. In the temperate zone, both in the northern hemisphere and in the southern hemisphere, the Sun never reaches the zenith but it culminates in the middle of the sky. The more you move from the tropics to the equator, the more the seasons and the division into four parts expressed in the temperate zone, gradually lose their distinctions which vanish completely at the equator. In the northern hemisphere during the winter solstice (between 21-22-23 of December) the Earth’s axis is tilted so that the rays of the sun are perpendicular to the Tropic of Capricorn. The night has the highest number of hours (we are at the beginning of winter), the Arctic ice cap is completely in the shade and the Antarctic one entirely in the light. In the southern hemisphere in December the day has its maximum length and we are in the early summer. At the summer solstice (between 21-22-23 of June) the situation of the two hemispheres is exactly the opposite and symmetrical. “(…) if we pay attention to natural causes we must recognize that in the southern hemisphere not only houses, but also the dignity of all the stars are different in our hemisphere: if the period of spring and other seasons differs in the two hemispheres, also the annual period of the sign of the zodiac starting from the same seasons, will differ. (…) We can notice that keeping the same division of houses easily leads the astrologer to make astronomical mistakes: when it is summer in the northern hemisphere, the signs of the zodiac behave in the southern hemisphere as the corresponding winter signs namely they will rise in ever faster time, while in the northern hemisphere they will arise slowly and all motions will not be right. Morin <De Villefranche> circumvents this difficulty operating strong rectifications to the upward difference, thus forcing the root cause to the house assignation which is based (…) on the motion. The signs of the zodiac are not arbitrary symbols, they exist in virtue of the annual lighting of the sun on earth and the process of this solar lighting has different times in the different hemispheres.” (G. Bezza, Commentary on the first book of Tetrabiblos of Claudius Ptolemy, op. Quot., p.315). The names of the cardinal points of the horizon were established in ancient times, over time they have become highly effective in any place on Earth, and they have been established in relation to the northern hemisphere. In the northern hemisphere, looking southward, we see the sunrise (east) to our left. Arriving for the first time somewhere in the southern hemisphere we could feel disoriented to find that the sunrise (east), looking southward, occurs to our right.